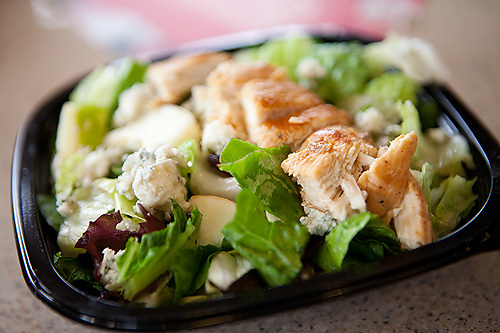 OC Mom Activities: Wendy's Pick 2 Salads are Delish! Last week I had the chance to meet up with some of my favorite OC and LA bloggers at the Wendy's Pick 2 launch lunch. 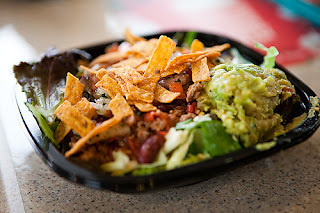 As I know many Moms do, I try to order a salad most of the time when we are at a fast food restaurant for a number of reasons. One reason is the reduced calorie count and the other is the nutritional benefit, but I think people are shocked when they realize that many of the salads at fast food restaurants are neither. Many are loaded with inexpensive and nutrient deficient ice berg lettuce and are loaded with high calorie fillers to enhance the taste appeal. 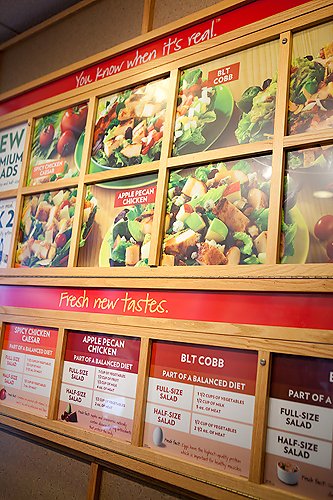 I was more than thrilled to see and taste the new Wendy's salads because they are exactly what I've been looking for in a fast food salad! They are made with nutritious items like cranberries, roasted pecans, apple slices and are accompanied by super yummy less calorie dense dressings like the pomegranate vinaigrette I had. I had the Apple Pecan 1/2 size Salad with Vinaigrette Dressing and I must say it was SUPER delicious and totally filling. Paired with a water bottle it was less than $6 and makes for a perfect salad on the go. I also love the fact that the salad had less than 300 calories! 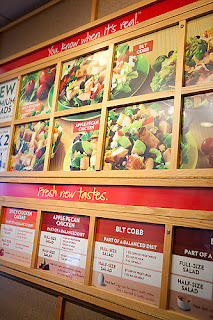 Other super yummy salad offerings are the new BLT Cobb salad (hearty mix of crisp Applewood Smoked Bacon, chopped egg, real blue cheese crumbles, grilled chicken and creamy Avocado Ranch dressing), the Baja Salad (rich and meaty chili with fresh pico de gallo, guacamole, tortilla strips and creamy Red Jalapeño dressing), or the Spicy Chicken Caesar Salad (Taste our warm spicy chicken with shaved Asiago cheese, grape tomatoes and Lemon Caesar dressing). Wendy's new Pick 2 menu allows you to pick two items from their Pick 2 menu all for $4.99 and that give you 28 different combinations! It makes a healthy lunch on the go affordable. Sound delicious? Be sure to head over to the OCMomActivities Facebook page for a fun Facebook only giveaway later today! *Photos above are used with permission. About the Photographer: Based in Long Beach, Kristin Eldridge photographs babies, children and their families in the OC and LA. She loves making art out of the everyday moments of childhood. Kristin's website features a variety of unique locations and her blog keeps you informed about special promotions and events. ** This post is part of a compensated campaign with Wendy's, but the opinions expressed are 100% genuine.